A 28 year old local hiker whose legs were pinned between boulders on a high ridge above Duck Lake called 911 and activated his emergency locator beacon. Ten SAR members in four teams were dispatched up the Duck Pass trail. CHP Helicopter H40 responded, searched the area for a while unsuccessfully, and then landed at the Horseshoe Lake borrow pit to meet with SAR team personnel to discuss additional search areas/strategy. After removing weight/equipment from the helo, the CHP crew flew back to the accident area with a MOSAR member and began searching additional locations based on data received from the subject’s cell phone. The victim was sighted by H40 at 37.56018, -118.94244 (11,900 feet) with the sun reflecting off the space blanket he was waving. 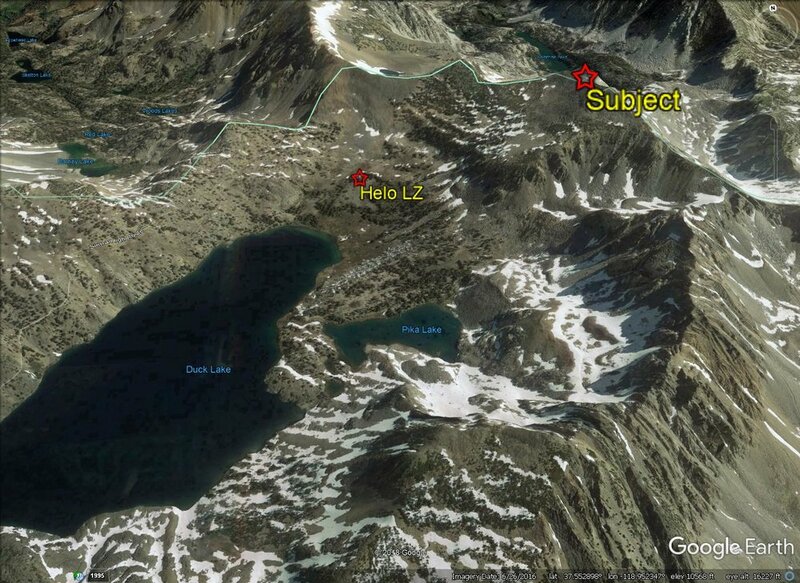 H40 landed at an LZ northeast of Duck Lake and debarked the MOSAR member, who radioed the lead ground team in the Duck Lake area the subject’s location. The other team was then able to see the reflections of the space blanket and began hiking directly to the subject’s location. The Ops Leader instructed the MOSAR member to leave H40 and join the teams in the field. A helo from Lemoore NAS arrived, in case additional SAR members or heavy lift equipment was need at the scene. It landed at the Horseshoe Lake borrow pit to pick up the heavy lift gear and a Mammoth Lakes Fire Department operator. They then flew to Duck Lake and attempted to insert the operator and lift gear near the accident site. Due to the high altitude and winds they were unable to do the insert near the accident site, so they then landed next to H40 at the LZ. The on-site team requested additional O2, and H40 was able to lower an O2 bottle provided by the Lemoore team to the ground team. After hoisting down the O2 bottle, H40 flew to Mammoth airport to configure for a hoist/extraction operation. Mammoth Lakes Fire Department personnel transported H40’s equipment from the Horseshoe Lake pit to Mammoth airport. Being unable to debark the equipment and operator near the accident site, Lemoore helo flew to Mammoth airport to drop off the lift equipment and operator they had pick up at the Horseshoe pit. They then returned to Lemoore NAS. When team members reached the subject, they assessed his injuries, provided him oxygen, and set up two mechanical advantage pulley systems (5 to 1 and 9 to 1) to move the boulder that was trapping him. Before successfully freeing the subject, several attempts had to be made with minor re-rigging of the pinning boulder in order to achieve a rock lift/pivot that didn’t put more weight on the pinned legs. Just after the subject was freed, H40 returned to the accident site and lowered the Bauman bag and a litter to the ground team. A quick patient packaging was done, and the subject was hoisted up to H40, and flown to Mammoth Airport. Mono County Paramedics transported him to Mammoth Hospital. The call was ended at 2230. Responders were: Beck (Ops), Hansen (IC), Kaufman, Bush, Hennes, Wallace, Greene, Torrence, Eimen, Quiring, Case, Endo, Cowan, Guffey, Gilbreath, French, and Hagan. The Team volunteered 158 man hours for this call.